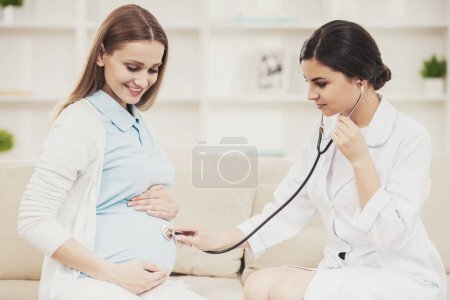 Pregnant Young Girl with Gynecologist in Hospital. Pregnant Young Girl with Gynecologist in Hospital. Therapist Listens to Stomach with Stethoscope. Maternal Concept. Healthy Maternity. Expecting Baby. Healthy Young Mother. Woman Tummy.